Josephinum Academy Presents "Two Gentlemen of Verona"
"...our impulses are too strong for our judgement sometimes." The Josephinum Theatre has recently performed and showcased "The Two Gentlemen of Verona" by William Shakespeare on February 4th, 5th, 6th, 9th, and 10th. Though Shakespeare's creations have a reputation for being quizzical and/or complicated, the cast and crew completed the admirable task of successfully translating Shakespeare's text through their hard work. Proteus- Emily G. Antonio, Eglamor- *Emy A.
Valentine- Tamae D. Thurio, Panthino- Hope T.
Julia- Melony A. Host- Emily M.
Sylvia- Jocelyn G. Lucetta, Outlaw 1, Musician- *Jackie V.
Speed- Anna H. Outlaw 2, Musician- *Arianna L.
Launce- Xochitl V. Outlaw 3, Musician- *Jessika M.
*Assistant Stage Managers- Jackie V., Arianna L., Jessika M., and Emy A. The setting of the story takes place sometime during the late 1950s in Verona [Italy], Milan [Italy], and a whimsical forest. The Two Gentlemen of Verona, Proteus the "thinker" and Valentine the "adventurer," are close friends who maintain a brother-like relationship due to their differing personalities. In order to escape the strict conformity of Verona, the two gentlemen decide to try new things: Proteus does this by falling in love with Julia, and Valentine decides to leave Verona to visit Milan. However, Proteus makes his situation with Julia complicated by promising himself to her; this is an obligation that he is eventually unable to fulfill. Despite the fact that Julia is uncertain of how much Proteus really loves her, she still finds herself drawn to him. Julia's maid Lucetta has an interesting perspective that makes this situation even more of a reality for Julia! Proteus's father, Antonio, feels that Proteus should join Valentine on his venture to continue his education. Proteus is not thrilled with this idea because he is infatuated with Julia, but Antonio still decides to send him off. Before he leaves, he exchanges rings with Julia. Valentine meets a girl named Sylvia, but at times he doesn't seem to be good enough for her. Sylvia is a wealthy girl, and her father is the Duke of Milan. However, Valentine's servant Speed insists that Valentine should pursue Sylvia. Valentine eventually has to take desperate measures to woo Sylvia. In one scene of the play, Valentine has musicians perform a song dedicated entirely to her, but she remains a bit indifferent. Eventually, Proteus realizes that he has now become infatuated with Sylvia and has almost forgotten about Julia. If he cannot contain his feelings, he will attempt to gain Sylvia's love instead of Julia's. Unaware of this, Julia decides to visit Proteus, but Lucetta warns her that a trip may be dangerous for a young woman. Julia then decides to disguise herself as a boy. The two gentlemen eventually create further turmoil. Each character plays an important role in this dilemma, and they are each somehow affected. Mr. Fehr writes, "The struggle that all of the characters encounter is how to balance their desires and instincts with the expectations that have been set upon them by family, society, and (the ever encroaching pressure and shadow of) adulthood." 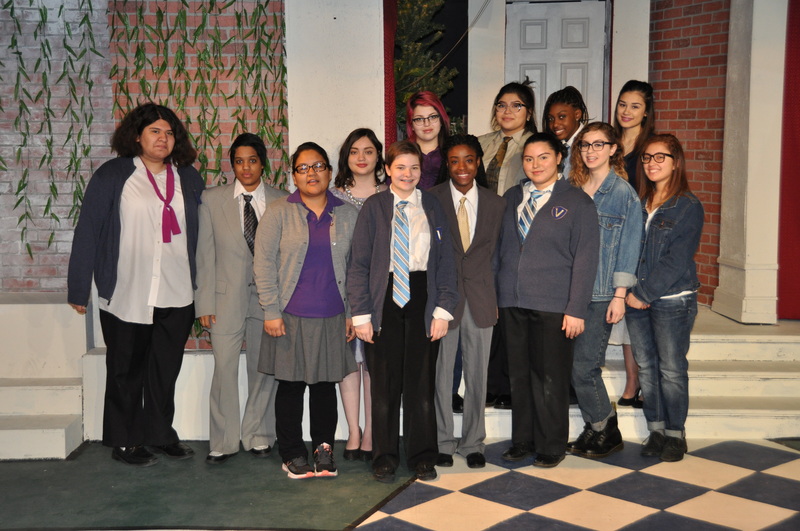 Josephinum Academy's production of "The Two Gentlemen of Verona" was a very complex and well-executed project. As an audience member and prior Shakespeare course student, I find this to be reflective of how the text of Shakespeare is able to be applied to various life lessons. Having been behind the scenes for prior school theatre productions at Josephinum, I know how much work is required to produce a series of performances. I'm very impressed with this cast and crew! Don't forget to join us for our next production, HerStory, on March 24 at 3 p.m.!